On 1 February, more than 100 leaders from business, government and civil society gathered in Canberra, Australia to explore the role of Government as a catalyst for creating shared value partnerships. The forum examined the latest thinking on how the public sector can play a vital role in enabling and promoting shared value in private sector partnerships, and the changing role of business and government in solving social problems. Government is key to creating shared value opportunities at scale, by acting as a knowledge broker, operating partner, convenor, and contributor of Government resources. The forum illustrated that Governments have an opportunity to leverage resources, knowledge, capabilities and innovation from the private sector. An example presented was Australia's Department of Foreign Affairs and Trade’s flagship private sector engagement program, the Business Partnerships Platform (BPP). Guest speakers Justin Bakule and Dane Smith from FSG highlighted how the use of the shared value framework in the public sector has proven to be successful overseas; citing examples including Yara, the world’s largest mineral fertilizer company and Italian energy company Enel. 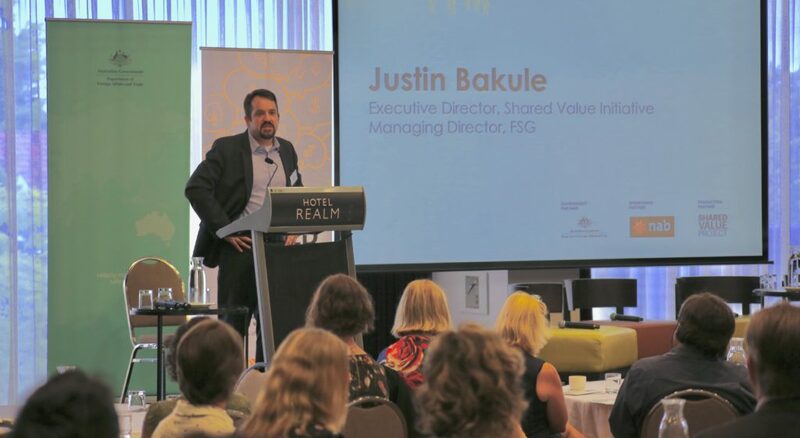 Justin Bakule gave an overview of shared value as a framework, and explored how the connection between government and the corporate sector works. Businesses that link social prosperity and social progress to commercial returns will be the businesses that thrive. Shared value is about creating profitable and scalable, sustainable solutions to societal problems. A panel discussion involving NAB, DFAT, NSW Treasury, Cotton Australia and the Global Compact Network Australia resulted in a lively conversation about what shared value looks like across diverse sectors. The panellists all shared unique perspectives and experiences on their shared value approaches when engaging with the private sector. It was a fitting platform to demonstrate a powerful and common agenda for change. DFAT plays a vital role in shaping Australia’s place in the international environment, and promoting shared value is key to its engagement with the private sector. The Forum recognised the potential for further engagement on shared value across government. Government can play a vital role in creating shared value partnerships. There is an opportunity for government and NGOs to collaborate with business, bringing new ideas, expertise and resources to address complex social issues and scale social solutions. A tectonic shift is underway in Australia with a rebalancing and generational shift in the roles of business, government and civil society. Business is at the table in a meaningful way. Identifying a social problem can and should maximize business returns. Large corporations and Government have already proven that opportunities for growth and impact come from creating shared value, but there is still a lag in moving from idea to action. Future successes will involve aligning business expectations with a longer-term approach, where traditionally shorter timeframes have been adopted. The right kind of regulatory framework can encourage companies to pursue shared value. Governments need to invest in infrastructure, jumpstart markets, and de-risk in ways that encourage shared value partnerships. Leaders of companies can and should choose to adopt the five elements of implementing shared value; embedding a social purpose, defining the social need, measuring social and business value, creating an innovation structure, and co-creating with external stakeholders.